Accelerators are useful sources of high-energy particles that have potential as drivers of secondary sources such as synchrotrons and free-electron lasers (FELs). They have become ubiquitous tools in academia, healthcare, and industry. High-energy electron beams are usually produced by concatenating numerous accelerator sections. The low accelerating gradients of these conventional accelerators result in large and expensive devices. Plasma has been demonstrated as an alternative acceleration medium. An intense laser pulse can be used to separate charge and produce extremely high accelerating fields, which significantly reduces the cost and footprint of such systems. Our research group is actively engaged in a variety of projects investigating the interaction of high-intensity lasers and plasma, ranging from studies of fundamental physical processes such as strong-field electrodynamics and radiation reaction, to investigations into the acceleration process, applications, and the development of future devices. The figure shows electron number density from a numerical simulation of a high-intensity laser propagating in underdense plasma (using the EPOCH PIC code). The ponderomotive force of the laser pulse displaces plasma electrons, causing them to oscillate and create an evacuated region behind the laser known as the “bubble”. The more massive ions left in the bubble generate electric fields of the order of 100s GV/m. Electrons can then be “injected” into the rear of the bubble and “surf” the plasma wave, acquiring very high energies over a short distance. SCAPA is a new facility based at the University of Strathclyde that is dedicated to the application of high intensity lasers and secondary sources. The wide range of applications include particle colliders, the generation of X-ray to terahertz radiation, production of isotopes for imaging and nuclear medicine, particle beam radiotherapy, and production of ultra-short pulses as probes of matter evolving on attosecond time scales. The development of methods to control the acceleration process and the properties of the accelerated electrons is central to problems being pursued by our group. In addition to producing high-energy particles, plasma can also be used as a light amplifier to produce extremely high-intensity laser pulses, beyond the current state-of-the-art. Raman amplification is one of several processes being studied by our group. Numerical simulation enables complete and reproducible control of the laser and plasma parameters, unlike in experiments where they can vary from shot-to-shot. 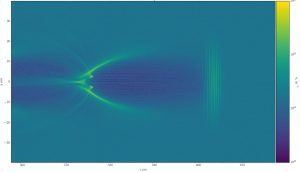 Simulations can also provide access to information that is difficult or even impossible to obtain in experiments, such as individual electron trajectories. This information does, however, come at a price: the many degrees of degrees of freedom requires significant computing resources, especially for simulations in 3D. Furthermore, plasma phenomena often occur on different time and spatial scales, which makes simulations very challenging. It is often the case that many large-scale simulations are required to determine optimal values or observe a predicted effect. However, simulations also enable the development of reduced models with less intense computational burden, allowing interesting regimes to be predicted or identified more easily. The availability of HPC access is critical to both present and future success of research in this field. For more information about the project contact Dr Samuel Yoffe (sam.yoffe [at] strath [dot] ac [dot] uk), Research Associate or Prof. Dino Jaroszynski (dino [at] phys [dot] strath [dot] ac [dot] uk) at the Department of Physics at the University of Strathclyde.